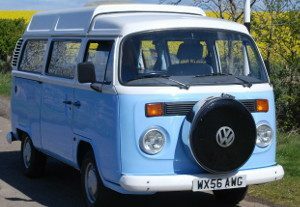 We are a hire business operating classic VW Campervans based in East Lothian near Edinburgh, just a few minutes from the A1 North/South road link and main East Coast Rail Line and thus ideally located as your starting point to tour The Highlands and Islands, The Scottish Borders, Lake District or Northumberland. Boris is our first liquid cooled Brazilian Type 2. Unlike Tilly and Dotty he has the more powerful and refined liquid cooled engine. 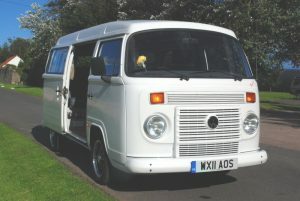 Gina is an original T2 born in Wolfsberg in 1979 making her one of the very last and final German built ‘buses’. Approximately 4 years ago she underwent a full ‘no expense spared’ restoration and fit-out. Dotty is our second Brazilian Type 2. 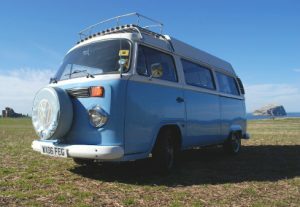 Like Tilly she has the classic flat four engine (complete with ‘proper’ classic VW soundtrack!) but benefits from fuel injection which makes these Brazilians more economical than the original German versions. Tilly was born in the Sao Bernado do Campo plant in Sao Paulo Brazil in 2004. 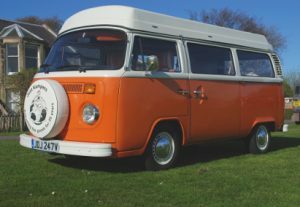 Production of air cooled T2s ceased forever in 2005 making her one of the last air-cooled buses ever made. She has a full Danbury fit out to a high level specification. 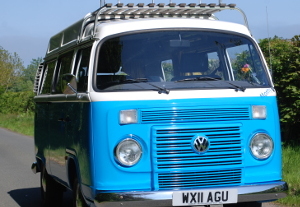 Monty is our second liquid cooled Brazilian Type 2. Unlike Tilly and Dotty he has the more powerful and refined liquid cooled engine. It makes him a more relaxed cruiser and perhaps a little easier to drive.